When I started this blog, I had no idea how mechanical it would turn out to be! But when you own several old and tired pieces of machinery, as I always have, then mechanicking is something you have to do a lot of sometimes. However, this winter has been way crazier than usual in that regard. After the tour with the Eco-Gals was over, I went back over to Astoria the next day and towed the broken-down Subaru home. 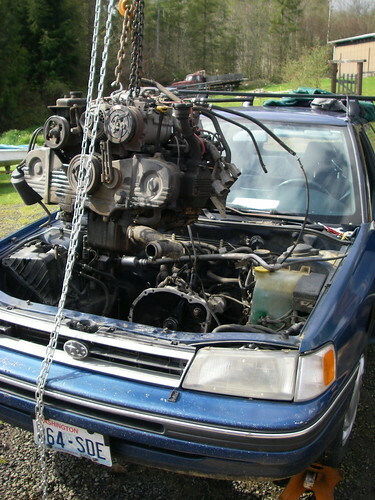 I spent days looking for an engine, and found a few equally tired ones in junkyards, but many of them had almost as many miles on them as my dead one did. 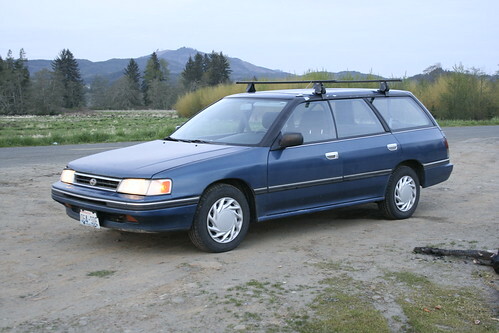 Then I stumbled across a clean, allegedly rebuilt 1994 Subaru EJ22 on Craigslist, for $800. It was complete and sparking clean. All I would need to do is swap my new clutch and flywheel onto it and drop it in. So I drove down to Portland and bought it, before someone else did. After I picked up the engine, I ran around town and did some other errands and ended up stopping for pizza at Bella Faccia on Alberta Street. While munching on my pizza, I was absentmindedly looking at the living section of the newspaper and scanned my horoscope. “Not a good day for making major purchases, what you might buy today won’t turn out to be as good as you thought,” or something to that effect. Not exactly what I needed to hear right then, so I just folded up the paper, pushed it away and pretended I never saw it. Jeez! The new engine is super clean and has obviously been rebuilt, with everything on it, alternator, wiring harness, and all the fuel injection parts. I started working on it on Friday after spending hours moving other mechanical projects out of the way so I could use the engine hoist. I finally got started on the engine swap at about 3 PM. I was feeling pretty competent and I had thought of taking pictures as I went along at various stages and timing myself. It took an hour and 15 minutes to have the engine dangling in the air, and I was on the path towards a running car that evening. 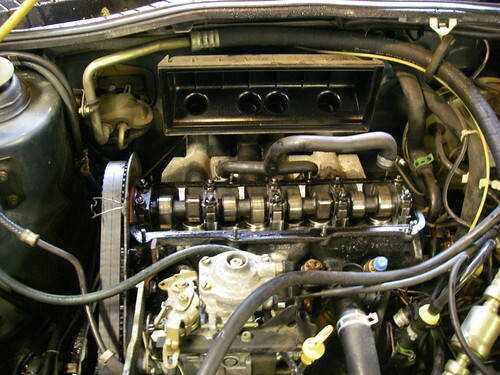 That is, until I noticed that the plugs that plug the engine into the car were totally different on the new engine. Damn that horoscope! 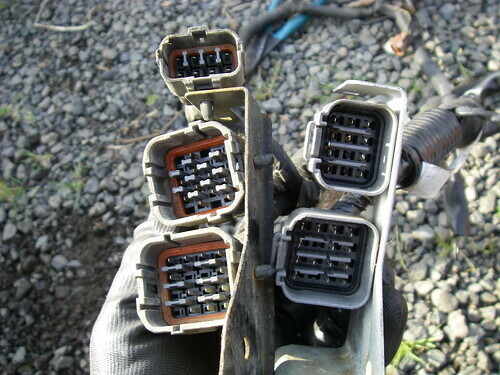 That shiny new wiring harness was no good at all to me, so I spent the next two hours changing it out with the old one. Right about dark, I had the new engine in and bolted up, but not yet running. The next day I was able to get everything hooked up right and running, but had to change back to my old alternator after a quick trip to the gas station left me with a dying battery. That cursed horoscope again! Fortunately, that was about a ten minute job at the most. 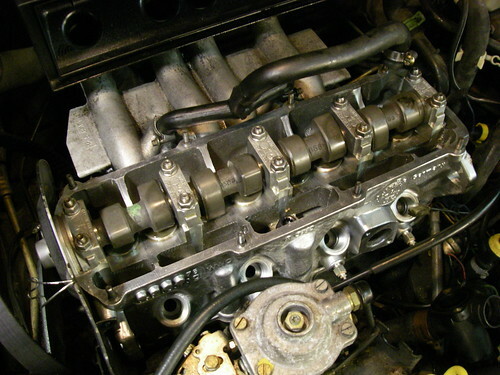 The EJ22 engine, up to 1995 anyway, is a non-interference engine. This means that if you were to break your timing belt, the car would stop running, of course, but the pistons and valves would not collide with each other, and you would only need to change the timing belt for a new one to be on your way again, unlike many modern engines, whose tolerances are so tight that there is no room for things to miss each other in the event of a broken timing belt. 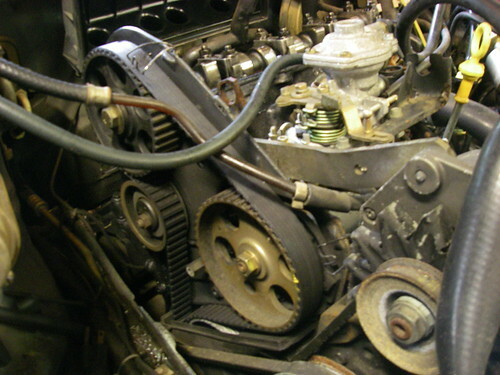 Also, without considering the air conditioning belt, the EJ22 engine has only one accessory drive belt, running the alternator and power steering pump. 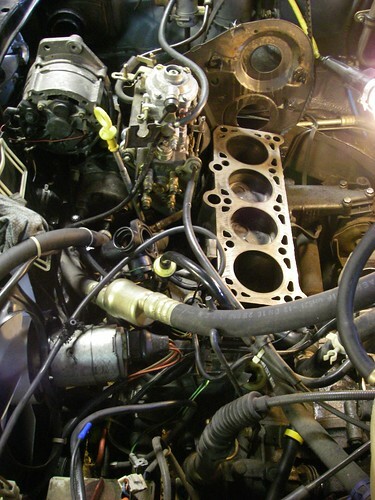 The water pump is actually driven off of the timing belt, so as long as the timing belt is intact, your water pump is turning. Also a good design feature. A short postscript: Today, in the middle of the day and with no obvious cause, or warning, that dang transmission that I just put in a couple of weeks ago starting making a new and troublesome noise. Will it ever end? I guess that’s what I get for $90. Fortunately, this still has a warranty on it. If I can’t figure it out right away, I will exchange it next week for another. Crikey! OK, well it’s back to work on the broken Jetta. I just can’t afford to drive this truck everywhere I need to go! I went back to Portland a few days ago, and spent another pile of cash on more parts. Aren’t they purty? That’s about $720 sitting there! Anyway, on to the task at hand. We left off with the head removed and marveling at the damage. The next job is to scrub the top of the block and the bolt holes clean, and get the head ready to install. Manifolds go back on now, and new glow plugs. Another task that you won’t find in the Bentley manual is peening the head around the pre combustion chambers. 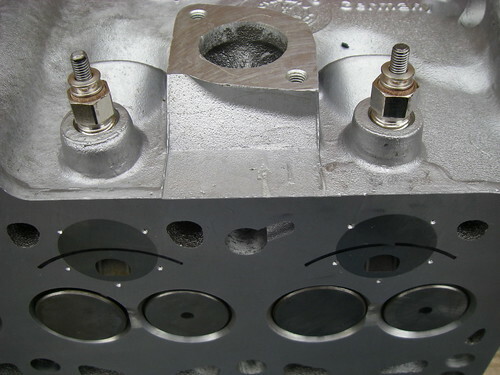 These little inserts are common to many indirect injection (IDI) diesel engines and have been known to work themselves loose and fall out of aluminum heads like this one. So a few strokes with a punch and a hammer are needed to deform the soft aluminum around the inserts and help keep them from coming loose. Careful not to peen where the sealing edge of the gasket sits! That’s what the little arcs in pen are for: to remind me of where that edge will be. 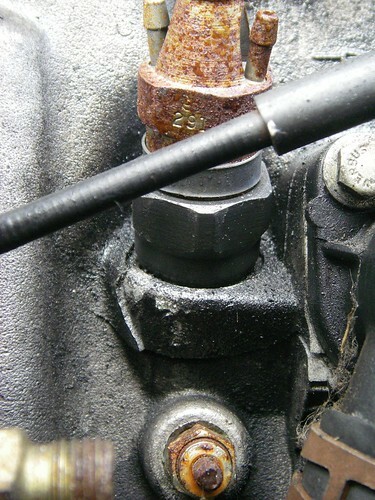 Thanks to the guys at dieselvwparts forums for making me aware of this potential trouble spot. Make sure that none of the pistons are at the top of their stroke when you set the head down, so you don’t damage a valve. These diesel heads have next to no room to spare for a valve being open in the wrong place. After some futzing around and improvising to hold the gasket in place, I set the head down and started the bolts in finger tight to hold it in place. This is an awkward job if you are alone like I was. Careful of your back, that thing is heavy with the manifolds on. Next thing is to lightly oil the bolts around the washers, cross your fingers and torque the head to the Bentley manual specs. 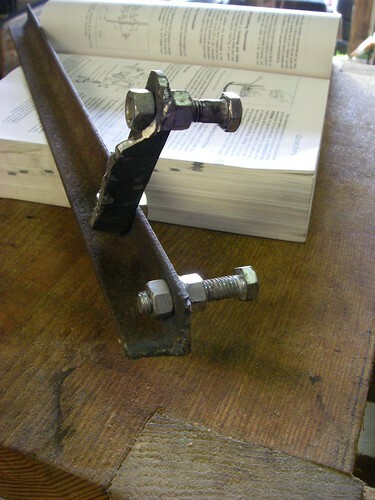 These are Torque to Yield (TTY) bolts and can only be tightened once. At this point, I had to switch programs to deal with some tedious tasks: changing the water pump and the intermediate shaft seal. None of this part was very fun, and I was too distracted to remember to take any pix. I had to make a special tool to hold the IM shaft pulley while I removed the bolt. Here is version 2 of that tool; version 1 was partly made of flat stock instead of angle iron and it bent all to heck when I leaned into it. I sure love having a cutting torch around. I know this isn’t as pretty as one made with a bandsaw and a drill press would have been, but the torch is fast. I lucked out on the water pump; often the bolts just break off in the aluminum housing, leaving you with a really annoying removal job or another trip to town for a new housing. Fortunately for me, someone had already changed the water pump once before, and all the bolts came out easily and without breaking. So, at the end of the workday today, I have the head installed and torqued down, the water pump, thermostat and IM shaft seal all replaced with new ones, and I am ready to install the timing belt and rebuild the injectors. Stay tuned! Tomorrow, though, is a kayaking day. Well, after I towed home the green Jetta a while back, I looked it over and decided that it has so many things wrong with it, that it would be cheaper and faster to get my other Jetta going instead. 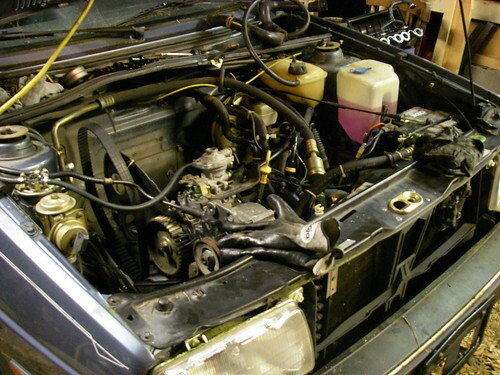 The blue Jetta is an ’89 diesel, with only about 135k miles on it, half the mileage that the green Jetta has. I got it for $300 off of Craigslist about a year ago, because it had a cracked head. 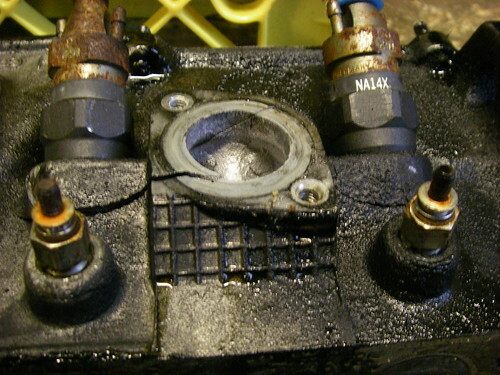 The previous owner had installed new injectors, but he overtorqued them and cracked one of the injector wells. It also has some damage to the front fenders. For $300 though, it has all new shocks and almost new tires on nice factory VW spoked alloys. The interior is pretty clean, although not as plush as the green Jetta, which is a Carat, with the sunroof, power window and premium seats and upholstery. I’ve been wanting another diesel VW for a long time. Many years ago I had a couple of diesel VW Rabbits, and they were great cars that were very cheap to drive. So I was initially really excited when I dragged this one home. I think I can get this one going for about $700-800 and a few days of work, and it should get mileage in the high 40s to low 50s if my previous diesel VWs are any example. And I will be able to burn biodiesel in it. I have been using that in my Cummins powered Dodge truck off and on for the last year. It runs great and smells nice, too! I looked for a new head for this car for a awhile, after I was told that the crack could not be welded. Turns out that the model of diesel engine I have here was not a very common one, and finding another head was not easy. I finally found a brand new one on eBay, located in Vancouver, WA and miraculously, I won, even though I was away from the computer when it closed. I got run all the way up to my maximum bid, too. 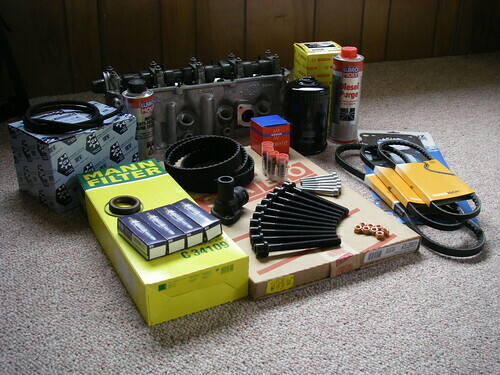 After picking up my prize, I headed over to Halsey Auto Parts in Portland and got the requisite gaskets and so forth. It took me a half a day to clear out a stall in my shop and get the car rolled in there. Today, I dove in. Then it was on to cleaning up the broken head, removing manifolds and other parts that will go on the new head. By the time I got done with that, I was starting to get a new shopping list together. Several of the fasteners that held the manifolds on did not survive removal, and the glow plugs spun in the head when I tried to pull them. I also got my first good look at the extent of the crack in the head. The guy actually over tightened TWO of the injectors, and the crack traveled all the way through the water jacket and through two injector wells. What a mess! I would have just kept going and put the new head on today; I need this car to be running soon, but the messed up fasteners and glowplugs necessitate another trip to Halsey before I go on. Can’t do that until Monday or Tuesday, so tomorrow will be a desk day, catching up on all the office stuff I have been neglecting for the last couple of days.